What a great-looking guy. Love the way he puts all of it together — rolled pants, terrific shoes, scarf, jacket, chunky watch — but the front of the pants I find odd and distracting. Maybe if that were the back of the pants! The closure of the trousers draws the eye, certainly. Terrific look. Well done. Are those like fisherman's pants? If they are, then it's a very interesting choice of fabric. He wears the outfit well. The scarf is a nice touch. The jacket is beautiful, such a lovely cut. An amazing shot as always! Awesome scarf, loved the cuffed pants as well! Those trousers remind me a bit of the Japanese garment hakama, a bifurcated horse riding skirt/trouser worn by samurai. More at how they are attached at the waist. Very interesting shape. No. Too '90's. We already did this at David Salle openings…. Great jacket, nice pants. Separately. This is just too busy. A jacket like this should be its own acessory. I'd keep the shoes and the t-shirt and put on a pair of jeans with it. No scarf either. his style its fantastic!! I love his trousers !! lekisskiss.blogspot.com <–two girls blogging fashion in ny and chicago! Unsure of how I feel about this look, but this gentleman certainly has a unique personal style. The trousers are so soft and romantic of style but at the same time very modern and Dior Homme-ish. 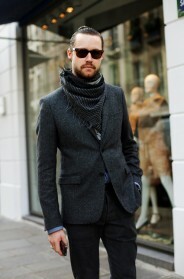 The structered jacket underlines the modern look, but the scarf gives the whole look a dandy feeling. Something in this look makes me think about circus. I love the Trousers! where are they from? I know we are not allowed to just say 'No' or 'Yes'. But 'No'. Twice. It's the kid on the Dutch Boy Cleanser's outfit. Very Dickensian & Artful Dodger. The trouser pleats focus the eye right on his crotch, or should that be his "Artful Todger"? Our eyes are drawn to his wierd crotch. A bit distracting. If not brave now… when? I have this notion that great style allows us to see the individual first and then the clothes. This outfit keeps me away from the individual for far too long. Another example of the frame overpowering the picture. No, not at all. Cannot do it. It's like a waiter on his lunch break who had to run out and buy a quick gift. Gorgeous style! I love PARIS, the food, the people, the shops.. I was there this weekend and I want more! I loved reading your interview in La Vanguardia! I adore your job Scott! YSL everything ? Pilati is genius. I prefer this jacket with the cropped version of the trousers. Something about proportions. Love this man's laughing eyes too ! I think he looks FAB!!! To me the styling now is all about showing your shoes off…He does it well! the folds of the pants directly over his crotch brings the hint of a renaissance codpiece to my mind. I love it. thought i could do without the trousers. definitely cant. does colette ship to canada? NO! As someone pointed out, everything together is too busy. He dares to be different– fantastic! JUST… FANTASTIC!!! GREAT LOOK IN A GREAT PLACE!!! Too feminine for my taste. A longer jacket had been better. PROS: His face is so kind and so energizing, and his pose is so natural. And the jacket is quite nice– wonder if it's vintage Gaultier??? CONS: The pants are not very flattering: Those pleats are terrible, and draping over the wrong area (or maybe that's the idea? ); would be better on a woman… the huge cuffs are very 80s and best left there. You can have all the best pieces from whomever… it does not mean they work together. On any given occasion, he should wear either the pants or the jacket. Together it's too much. I like the scarf. I love it when men wear scarves! This is not a good look. Love the jacket but not with the pants. Sad. the pants remind me of tokio kumagai designs from the 80's. love the full look! I am sorry but it doesn't look effortless. The pants are wrong. 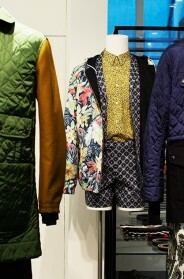 everything by YSL Mens Fall…this look is too hard…but nice jacket. Seconded on the hakama. Almost looks like he put on a pair and just rolled up the cuffs. The pants are maaaarvelous. Nicely done. He is a Spanish guy! I know him, he is gorgeous! 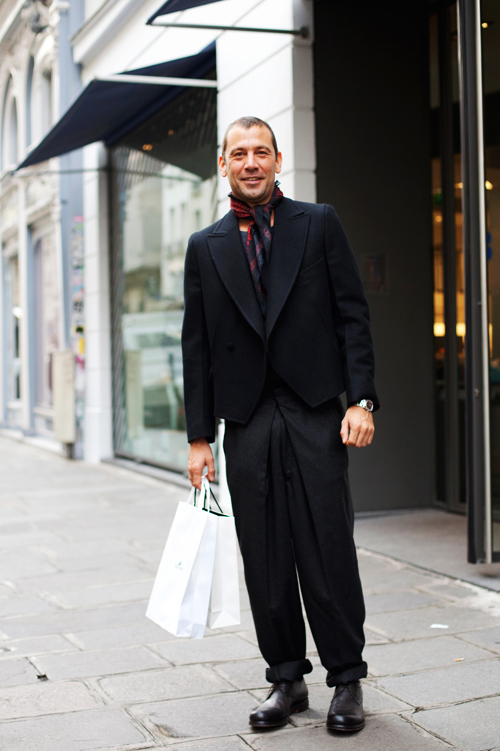 On first,you cannot roll the trousers in that way.And the jacket is too short: a black clown look. icky-poo, over the top pleats. And then the roll-ups! This is such a good lesson in how being comfortable sells the most desperate looks. If he weren't sure of himself this would be disaterous! His face does not translate to his outfit; it all doesn't fit. I think he looks awkward and the indivudual pieces don't help him either. love the cut of his pants! schwinnnnnnnggggggg! yikes, this fella is certainly happy to see somebody! Really people? I give this guy props for not giving a crap but my goodness… Those pants! They're awful! He looks like he just escaped a mental institution. es enrique campos de marie claire? My god this is awful! Enrique is always so cool!!! HA HA….everyone talks about…. "ohhh, the scarf", or "ohhh, the pants". Let's face it…or perhaps the bulge is just plain facing us…..rather highly too…. Nice shot, gave me a good laugh! And good on the guy….it's not like he wouldn't know what's going on, flaunt your assets. He looks like a waiter to me, the pants are too much i think. of course it looks wonderful, but it’s only because of his figure, look at that dancer waist!